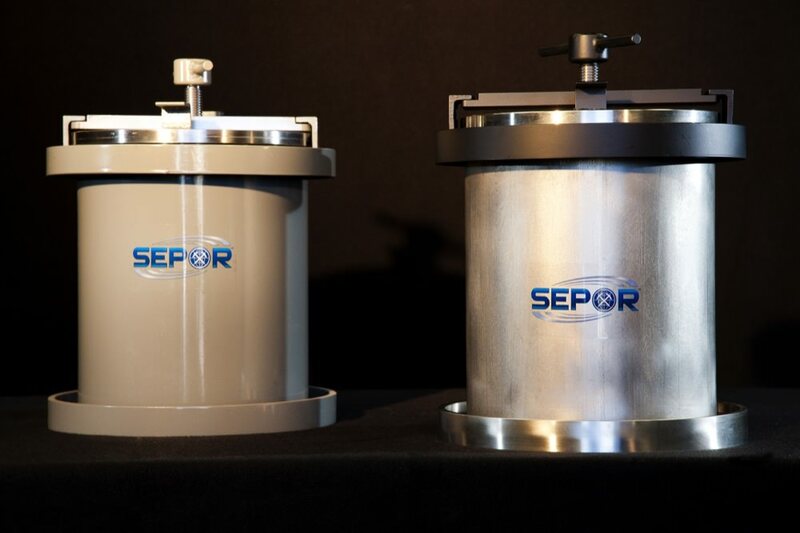 Sepor’s 5” Series Batch Ball and Rod Mill Drive is a rugged, heavy duty mill drive especially suited for steel grinding jars, or large porcelain grinding jars (5 gallon size). The drive mechanism is a 1/2 HP gear motor with a variable speed, capable of roll speeds between 40 RPM’s and 230 RPM’s. The rolls are 5 inches in diameter by 24 inches long, covered with 70 dura rubber, set on 10 inch centers. 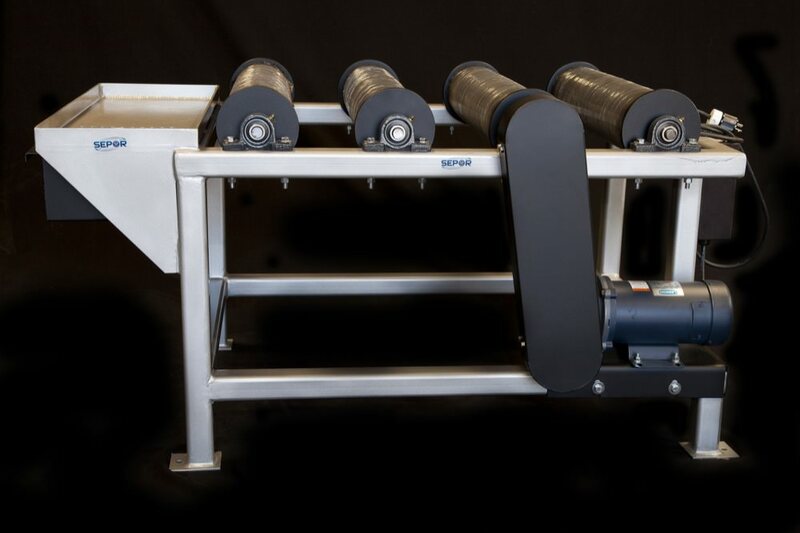 A work shelf and built in ball discharge grate is contained on one end of the mill frame. Photo is a batch steel Ball/Rod Mill, typically used with the 5” roll drives. The ball mill and rod mill are the same mill, and may be charged with either rods of balls. They are available in stainless steel, and carbon steel. Standard 20 pound grinding charges are also readily available for use in these mills. Generally, steel grinding balls are used with steel mills, ceramic balls are used with porcelain or ceramic lined mills and steel, ceramic, or other high density media is used with elastomer lined mills. Porcelain balls have a SG of 2.3 and have a average weight/volume of 12.8 pounds per gallon. High density alumina (ceramic) balls have a SG of 3.2 and have an average weight/volume of 17.5 pounds per gallon. Steel balls have a SG of 7.7 and have an average weight/volume of 40 pounds/gallon. Higher density grinding media generally results in faster grinding in a ball mill. An optimum grinding charge for a ball mill may be experimentally determined, however generally the range is from 20% to 50% of the mill volume, or to the center line. Approximately 30-40% of the ball charge will be void space. Material loads for ball mill dry grinding generally fall into the 25% to 50% of the mill volume range. If the mill is loaded with a 50% grinding charge and a 50% ball charge, it will not be 100% full, since approximately 30% of the ball volume is void space. Some experimentation will be required to obtain the proper mill charge for the most efficient grinding for various materials. If the mill is overloaded, it may not be possible to obtain fine particle sizes by grinding and the mill grinding efficiency decreases exponentially, as the grinding time increases exponentially. Therefore, mill overloading should be avoided. Material loads for ball mill wet grinding generally fall into the 30% to 50% of the mill volume range. The slurry could range from 30% to 60% solids by weight.. Some experimentation will be required to obtain the proper mill charge for the most efficient grinding for various materials. If the mill is overloaded, it may not be possible to obtain fine particle sizes by grinding and the mill grinding efficiency decreases exponential, as the grinding time increases exponentially. Therefore, mill overloading should be avoided.